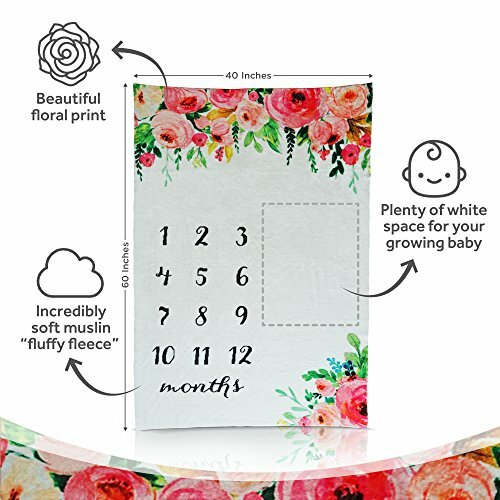 Perfect for milestones: keep track of your precious newborn infant as she grows every month. You will be receiving a premium, extra soft photography backdrop for your baby girl. Dress your precious little one in different outfits each month as you track her growth! Your family and friends will love seeing her progression through the first year of life. This warm and fuzzy hypoallergenic blanket can also double as a swaddle blanket for the nursery. Whether you are looking for the perfect baby shower gift or want to preserve the memory of your own child's first year of life forever, this blanket will help you do just that! As with all of our products, if you're not happy, we're not happy. Simply return for a full refund if you change your mind! "Add to cart" today!